Definition: The Linear Variable Inductive Transformer converts the linear displacement into an electrical signal. It works on the principle of mutual induction, i.e., the flux of the primary winding is induced to the secondary winding. The output of the transformer is obtained because of the difference of the secondary voltages, and hence it is called a differential transformer. The basic construction of the LVDT is shown below in the figure. 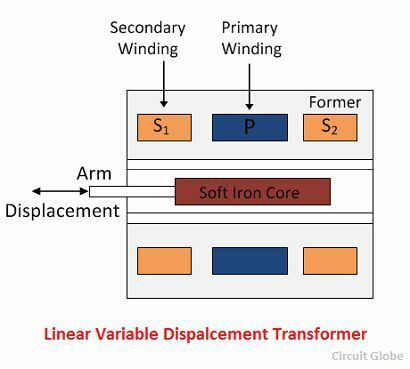 The P is the primary winding of the LVDT and S1 and S2 are the secondary winding of the transformer. The secondary winding is wound on the cylindrical former. The secondary winding has an equal number of turns, and it is placed identically on both the side of the primary winding. The alternating current source is applied to the primary winding. The soft iron core is placed inside the iron core. The displacement which is to be measured is attached to the arm of the iron core. The high permeability metal is used for the core so that the harmonics are less and null voltage is easily obtained. The displacement measured longitudinally, which reduces the eddy current losses. The whole of the arrangement is placed inside the stainless steel housing, and their ends provide the electrostatic and electromagnetic shielding. The frequency of the alternating current applied to the primary winding lies between 50 to 20 kHz. 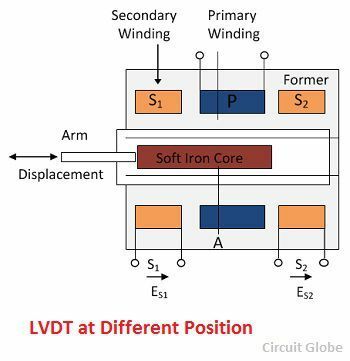 The LVDT works on mutual induction principle. 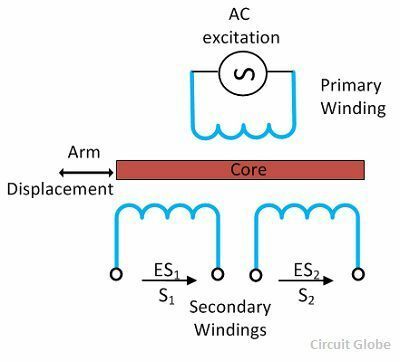 The current is applied to the primary winding which produces the magnetic field, and this field induces the current in the secondary windings. The output voltage of the secondary winding S1 is ES1 and that of the S2 is ES2. The secondary voltage signal is converted into an electrical signal by connecting the secondary winding in series opposition as shown in the figure below. The output voltage of the transducer is determined by subtracting the voltage of the secondary windings. 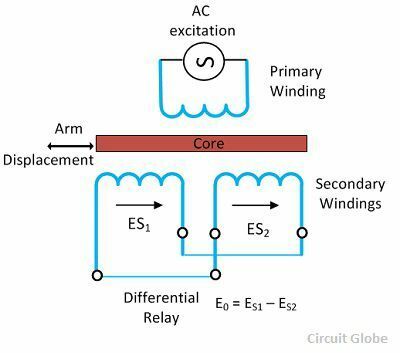 The output voltage of the secondary winding is equal when the core is in the normal position. When the soft core moved towards left the flux linked in S1 is more as compared to S2. The output voltage of the winding S1 is more than the S2 but it is in phase with the primary voltage. Similarly, when the soft iron core move towards right the magnitude of the flux linked S2 is more than S1. The output voltage is -180ºC out of phase with the primary winding. The change in output voltage is directly proportional to the displacement of the core. Any displacement will increase the flux of one of the secondary winding and on the other hand, reduces the other. 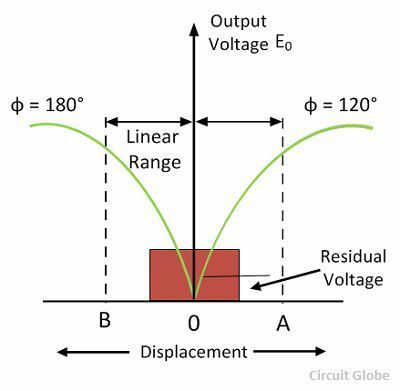 The curve between the output voltage and displacement is shown in the figure above. The curve is linear for small displacement and beyond this range, it starts to deviate from the straight line. The following are the advantages of the LVDT. High Range – The LVDT has the very wide range for measurement of displacement. Their displacement range is from 1.25 mm to 250 mm. High Input and High Sensitivity – The LVDT gives a high output and also there is no need for amplification. The sensitivity of the transducer is also very high. Rugged – It can tolerate the high degree of shock and variation, especially when the core is loaded with the help of spring. 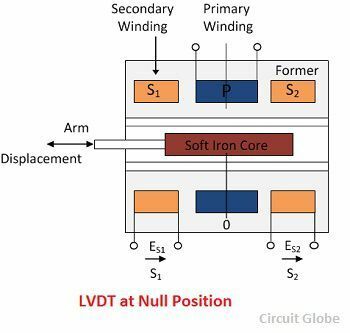 Low Hysteresis – The LVDT has low hysteresis because of which their repeatability is excellent. Low Power Consumption – The LVDT consumes power less than 1W power. The disadvantages of the LVDT are shown below in details. Large displacement is required for getting the considerable differential output. 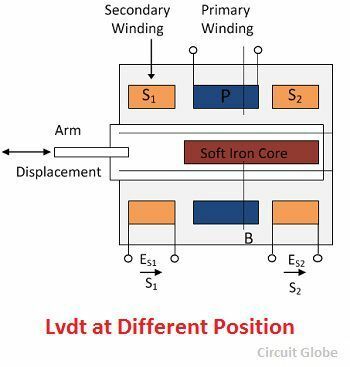 The LVDT transformer is very sensitive to the stray magnetic field. The performance of the transducer is affected by the vibrations. The dynamic response is controlled mechanically by the mass of the core and electrically by the frequency of the current. The performance of the LVDT is affected by the temperature. The following are the major applications of LVDTs. It is used for measuring the displacement having a range from few mm to cm. The LVDT directly converts the displacement into an electrical signal. It is also used as the secondary transducer. The LVDT is used as a device for measuring the force, weight and pressure. Some of the LVDT used for measuring the load and pressure. The LVDTs are mostly used in servo mechanisms and other industrial applications.